Saint Francis Xavier, S.J. 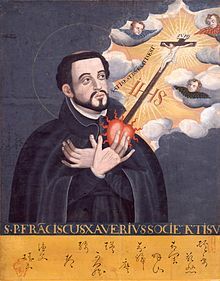 (born Francisco de Jasso y Azpilicueta, 7 April 1506 – 3 December 1552) was a Spanish Jesuit. He was made a saint by the Catholic church. He is known for his travels to Asia, including Goa and Japan. This page was last changed on 1 February 2018, at 19:01.